St. Justin Martyr, also called “the Philosopher,” was a follower of Greek pagan philosophies who converted to Christianity. He used his training in rhetoric, logic, and philosophical thought to write several outstanding defenses of the Christian Faith, addressing both Jews and pagans. After winning a debate against a pagan philosopher, he was exposed by his opponent as a Christian to the authorities and martyred in Rome. To read more of the writings of St. Justin Martyr, click here. The first thing that needs to be said in response to Rhology’s question is that St. Vincent’s canon is not our “rule of Faith.” Our rule of Faith is the Nicene Creed; Vincent’s canon is our rule for maintaining this Faith. And both logic and history show that it is a remarkably reliable one. Anyone who has done investigations, as I have, knows that collective memory is much stronger than that of any given individual. A robbery is committed; the police question each of the witnesses and assemble the full story. Some of the individual witnesses will err in certain details or not have witnessed everything involved. Combining their testimony, though, we are able to figure out exactly what happened. It’s the same with the Ancient Christian Faith. Some of the individual Fathers may have erred in certain details or not have had access to certain parts of the full Truth. When we assemble them together, though, we have the full story, and it’s easy to tell where this one slipped or that one was ignorant. A testimony to the reliability of this rule for maintaining the Faith is found in a comparison of the three most ancient Churches: the Orthodox, the Oriental Orthodox, and the Assyrian Church of the East. These three Churches have lacked Communion with each other for the last 1500 years; during that period, they have been separated through language, culture, geography, and mutual hostility, so the possibility of cross-fertilization is out of the question. Each of these Churches utilizes the same method for maintaining the Faith, the one spelled out by Vincent and which Rhology holds is unreliable. And, yet, other than those points on which they departed from each other 1500 years ago (the Miaphysitism of one; the Nestorianism of the other), they maintain exactly the same Faith and practice as the Orthodox. Here we have three Churches that have each individually used the same rule for maintaining the Faith, and prove the rule to be remarkably reliable through their agreement 1500 years later. Now that I’ve answered Rhology’s cross-examination question, I’d like to take this opportunity to address four atrociously illogical “points” Rhology raised in his answer to my question. With no well-defined grounds for corrective authority, the enemy has a much easier time taking a group of people off-course, and it doesn’t have to happen all at once. First, we do have “well-defined grounds for corrective authority;” in fact, we have several of them, including our Bishops, our historical Faith, and each and every Orthodox Christian. Yes, every Orthodox Christian has the responsibility of preserving the Faith. It’s hard to open up a cabinet and rearrange the items inside when everyone is holding a key and you need all the keys to open it. That said, Rhology’s point is moot unless he can show us a single way that Orthodoxy has changed in the last thousand years or so (to look at a well-documented era of history). If it hasn’t (it hasn’t, by the way), then Rhology has to answer why our rule of Faith has worked so well for the last millennium but didn’t work for the first 200 years or so of Christianity; as Rhology alleges, along with his Protestant brethren the Jehovah’s Witnesses and Mormons, some “Great Apostasy” of the Church (of course, Rhology refuses to name it such for fear of being associated with these pseudo-Christian cults, but it’s essentially the same idea). If the Orthodox Church has changed in the last thousand years, Rhology needs to tell us in what way(s). … the Church Fathers and other early Christian writers didn’t, on the whole, agree on much of anything besides monotheism. I could go on, but I’ll stop here because I think I’ve proved my point; Rhology disagrees with all of these things and yet they were believed in by all of the Church Fathers without exception, including the Apostolic Fathers, that class of Fathers who knew Apostles or close associates of Apostles. This presents a serious problem for Rhology; either all of these men simultaneously misunderstood the Apostles and just so happened to be in complete agreement with each other in their misunderstandings OR they all conspired together to distort the true message of the Apostles — so, which is your take on the “Great Apostasy,” Rho? Also, this “argument” that the Fathers are inconsistent with each other is one Rhology frequently uses, and every time he’s used it on me (about a dozen times thus far) I’ve made the obvious request: show me on what matters they disagreed. So, I’ll say it again “publicly”: Rhology, show us a single issue of any weight or significance that the Fathers disagreed on. You continue to smear their names by using this line — prove it. Show us all something, anything, that the Fathers are inconsistent on. Please. Show an EO that Basil or Athanasius pointed to Scripture as the final authority? But I’m sure that Rhology will now do as he did when his quote from St. Athanasius was shown to be a distortion of Athanasius’ real beliefs; he’ll claim that Basil, too, is being inconsistent. I have to wonder, though, what’s a more logical explanation: that two of the greatest minds of all time were both independently inconsistent on the same matter or that Rhology is [willfully?] misunderstanding them both? The well-attended council at Constantinople in 754 says that veneration of icons in worship is wrong? Not a single Patriarch, or even representative of a Patriarch, was present at, or even invited to, the Council. 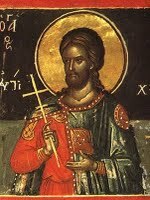 In fact, Emperor Constantine V intentionally called the council shortly after the death of the Patriarch of Constantinople, and before appointing a new one, in order to avoid opposition from a Patriarch and in order to coerce the Bishops of the council to follow his orders with hopes they might be the next Patriarch. The real Seventh Ecumenical Council, on the other hand, was attended by two legates from the Pope of Rome, the foremost Patriarch, and even presided over by the Patriarch of Constantinople, the second-ranking Patriarch, himself! Invitations were sent to the other Patriarchs, but were unable to be delivered due to Muslim dominion over their respective cities. To every one is given the utmost freedom of expressing his sentiments without the least hesitation, that thus the subject under enquiry may be most fully discussed and truth may be the more boldly spoken, that so all dissensions may be banished from the Church and we all may be united in the bonds of peace. And the most important point: the robber council departed from the Faith of the Fathers; the real Seventh Ecumenical Council did not. Icons have been in use in the Church since its earliest days — the archaeological evidence (see Dura Europos and the Roman catacombs, for instance) and written evidence (see Eusebius of Caesarea’s “History of the Church,” for instance) is solid. I’m sure Rhology, though, is going to try to assert that these all crept in later than the Apostles — in the second and third centuries — that’s fine, as that’s not the issue right now. Such an objection to the Apostolicity of images is only a tacit admission of the fact that the use of images was already firmly established in the whole Church by the second half of the eighth century, when these councils were held. Hieria departed from the Faith of the Fathers; Nicaea preserved it — that’s why one’s wrong and the other’s right. And the same can be said in the debate between Protestants and Orthodox today. 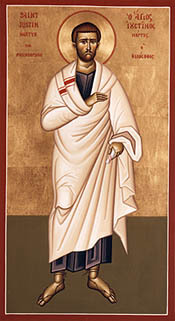 St. Polycarp of Smyrna was a disciple of St. John the Apostle and a friend of both Sts. Papias of Hierapolis and Ignatius of Antioch, who were also disciples of the Apostle John. He was martyred by being burned at the stake in about AD 155 and a very interesting firsthand account of his martyrdom survives to us today, which we’ll look at after his letter. Read that whole passage carefully, paying special attention the parts I’ve bolded. Notice what Polycarp is saying: that St. Paul came to Philippi and taught the people “face to face,” that is, orally, then, after he had left, wrote them a letter. And then Polycarp tells them that if they read that letter “diligently” they “shall be able to be builded up unto the faith given to you.” Note that: “given to you.” Polycarp is saying exactly what the Orthodox say today about Scripture’s relationship to the Faith: not that it is the sole source, but that it builds us up in that Faith already given to us orally through our teachers. But is Polycarp really supporting anything like Sola Scriptura here? No, he’s not. Let’s note that he’s not making a logically exclusive connection between the “sacred writings” and “nothing is hidden from you.” He says “and,” not “so.” And he also says nothing about the Scriptures alone. And, no doubt, if he had made this statement about some of the writings contained in Scripture Protestants would be proof-texting this in support of Sola Scriptura as well. Read St. Polycarp’s letter to the Philippians for yourself here. You can also read the firsthand account of his martyrdom here.